This pretty tree wall decal is shown here in our Extra Large size with lilac leaves and blossoms and a dark brown trunk. 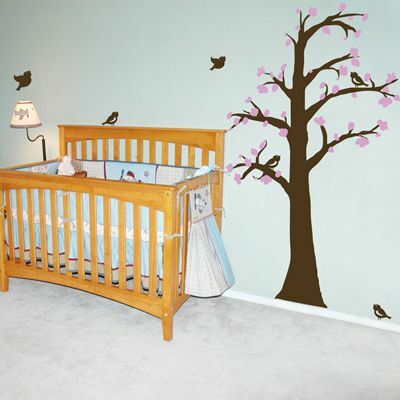 This tree also looks great with any of our greens for the leaves and buds, making it perfect for a girl's OR boy's room. Note: Birds shown are available through the link below. This tree wall decal is great addition for a baby's nursery or play area! You can even put it in your office or work space to liven up the atmosphere and bring some color in. If you need a size that's not listed here, please contact us! I recently purchased several custom orders for my office. I worked with Alicia, and she is fabulous. She promptly answered all of my questions (and I had several! ), and she made sure that my order exceeded my expectations. I look forward to receiving my shipment, and I will be referring clients, friends and family to your company. Thank you Alicia and Dali Decals!! !